Dagestan, Chechnya, Ingushetia send the largest number of Russian pilgrims to Mecca and Medina. Russian Muslims tend to find the pilgrimage more physically and mentally challenging than Indonesians, Malaysians and Iranians. The Russian Hajj Committee has begun accepting applications from the country’s Muslims for the annual pilgrimage to Mecca and Medina. According to Rushan Abbyasov, first deputy chairman of the Council of Muftis of Russia, internal republics in the North Caucasus such as Dagestan, Chechnya and Ingushetia send the largest number of pilgrims from Russia to Saudi Arabia. Tatarstan also sends a significant amount of pilgrims, he said, adding that there are even a few groups from Siberia and the Russian Far East. The Muslim holy sites became more accessible to Russians after Perestroika. While pilgrims from Russia are more aware of the hardships of undertaking the pilgrimage, they still find the trip physically and mentally challenging, according to Rashid Al-Rashid, who works at the Russian Hajj mission. “The Russians are not as well prepared as pilgrims from Indonesia, Malaysia, Turkey, Iran,” says Al-Rashid, who has been accompanying pilgrims to Saudi Arabia for more than 15 years. He says the hot weather and large crowds tend to overwhelm Russian pilgrims. They also take time to adjust to Arabian cuisine. The pilgrimage has become prohibitively expensive for many Russians this year since the ruble depreciated. The cost of a package tour has doubled this year and can be as expensive as $5000, which is around half a year’s salary in some regions. “A couple of years ago, we had a long list of people willing to go, but this year, we had to run publicity campaigns to attract people,” said Syed Muhammad from the Medina Travel agency. 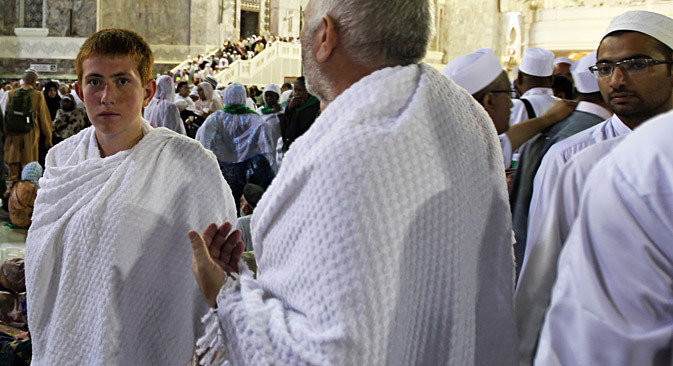 However, despite the drop in demand, the Hajj mission of Russia requested the Saudi Arabian authorities to increase the Russian quota from 16,400 to 17,000. This is on account of Crimean Tatars, who previously traveled on Ukrainian passports, but are now Russian citizens. According to the last census (taken in 2010), there are around 14.5 million Muslims in Russia, forming about 10 percent of the population. Immigration from former Soviet republics has pushed up the numbers over the last few years, although there are no updated official statistics available at the moment.